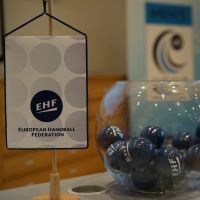 Round 1 of the Men's EHF Cup will feature a number of tasty ties, drawn on Tuesday morning in Vienna by EHF Chief Sports Officer Markus Glaser with the help of Vladimír Orság of Dukla Praha and EHF National Teams Competition Manager Peter Sichelschmidt. Switzerland's Kadetten Schaffhausen must overcome RD Koper of Slovenia in their first season out of Europe's top flight in five years, while 2015 EHF Cup Finals participants and VELUX EHF Champions League regulars Gorenje Velenje face Sweden's Alingsas HK. Last season's Challenge Cup winners AHC Potaissa Turda have been handed a big test on their first step up to this level in the form of FC Porto.